Getty/Rick T. WilkingThe minimum-wage increase applies to all of Amazon’s workers, including in fulfillment centres. 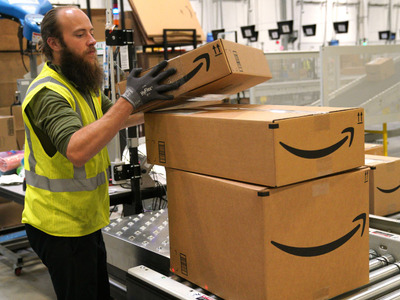 Amazon announced on Tuesday that it would raise the minimum wage for all of its workers to $US15 an hour effective November 1. “We listened to our critics, thought hard about what we wanted to do, and decided we want to lead,” CEO Jeff Bezos said in a statement. The change most likely means the company, which has repeatedly been attacked for its business practices by politicians and activist groups, is taking a hard look at what people are thinking and saying about it. The company on Tuesday announced it would raise the minimum wage for its US employees to $US15 an hour, including for those working in its fulfillment centres. Some employees who are already making at least $US15 an hour will also see a pay increase. Amazon raised some wages for warehouse workers in September as part of an annual evaluation, but the new announcement, set to take effect November 1, reaches throughout the company nationally and includes all subsidiaries. The company’s leadership hailed the move as a moral win. Amazon said it would also start lobbying for a federal minimum-wage increase to $US15 an hour from $US7.25. The e-commerce giant has long described its pay as competitive with other retailers. It often touts its stock options and other benefits as part of its pay practices. But Amazon has taken numerous hits on its reputation over the past several months. For example, Sen. Bernie Sanders frequently makes an example of Amazon, pointing to high-profile news stories describing strenuous working conditions and low pay. Tweets from Sanders’ account frequently portray Amazon as the biggest villain of capitalism, and they often compare the wealth of Bezos, who is the richest man in the world, with that of Amazon’s lowest-paid workers. On September 5, Sanders even introduced legislation to the US Senate that would impose a 100% tax on government assistance received by workers at companies with more than 500 employees. For example, if an employee draws $US100 from food stamps, that person’s employer would be taxed the same amount. Amazon fought back against Sanders’ claims, calling them “inaccurate and misleading,” in a rare blog-post response. But now Amazon is trying a different approach. Bezos’ acknowledgment that Amazon took a look at itself and decided it would change is a major win for Amazon’s critics and employees, but it’s also a win for Amazon. It’s hard to see the wage increase as anything other than a response to critics. Amazon most likely already anticipates a federal minimum-wage increase to coincide with the minimum-wage increases already happening in some blue states. The labour market is also tightening as the US heads into the holiday season, which could naturally inflate wages. But to make a splashy announcement at all means Amazon wants customers to know about it and, perhaps, to even feel a bit better about shopping at the retailer.